A 6-0 rout of Belgium didn't reveal much about the U.S. women's national team that wasn't already known, and as the Women's World Cup nears, there's an urgency among the U.S. to fine-tune its defensive chops against its toughest competition. In the Americans’ six preceding games, they had allowed 10 goals, showing an uncharacteristic sloppiness in the back that raised concerns about their chances of repeating as World Cup champions. Although they achieved their shutout of outgunned and overwhelmed Belgium–and scored six goals of their own–they did not completely alleviate those concerns, despite allowing just two shots on goal and requiring not a single save from an American goalkeeper. Recent doubts about the USWNT’s back line seemed to have been allayed a month ago, when the U.S. blanked Brazil, 1-0, to close the SheBelieves Cup. Then it gave up three goals to Australia (in a 5-3 win) on Thursday. Two of those goals—the result, respectively, of a positioning error by right back Emily Sonnett and a header in which Abby Dahlkemper was outleaped–brought back memories of the 2-2 draw with England on March 2 in which a miscommunication between Davidson and Crystal Dunn allowed the Lionesses to score. Australia’s attacking success also harkened back to the 2-2 draw with Japan on Feb. 27, in which an errant clearing pass by Davidson led to a Japanese goal and the failure to mark a weakside attacker led to the late equalizer. But mainly, the three Australia goals brought back the anxieties that were stoked during France’s 3-1 shellacking of the Americans on Jan. 19, when U.S. defenders were repeatedly outsprinted and outworked. "After [the Australia match in] Colorado, we watched a lot of video," head coach Jill Ellis said after Sunday’s win. "Scoring five goals [against Australia], we felt very good about our attack, so we drilled into some of the defending. That will continue into this next camp, really making sure we lock things down." Forward Christen Press said that the main messaging within the team since the Australia match had been focused on the collective defensive effort. "We definitely have to clean it up defensively," said Press, who assisted on three of the goals vs. Belgium as part of her chief duties as a winger. "The whole year, that’s been a big focus. And defending well involves the whole team. Including me." Dunn, who usually plays in the back but started in the midfield against Belgium, said that the frequency with which opponents have found the back of the net has been a wake-up call. “If we make mistakes, teams are going to punish us,” she said. In fairness, the recent opponents haven’t been pushovers. Belgium, ranked 20th in the world by FIFA, is the weakest team the U.S. has played in 2019. The other six opponents are all in the current top 13–and the competition in the World Cup after the USA faces Thailand (34th) and Chile (39th) to open group play will only mirror those earlier tests. The overall growth around the world and from some of the USA's top competitors hasn't escaped Press, either. One way that other national teams have “evolved,” according to Ellis, has to do with youth training. “In England and France, their 16-year-olds are playing against women," Ellis said. "Our 16-year-olds generally play against 16-year-olds. That’s something we need to look at. 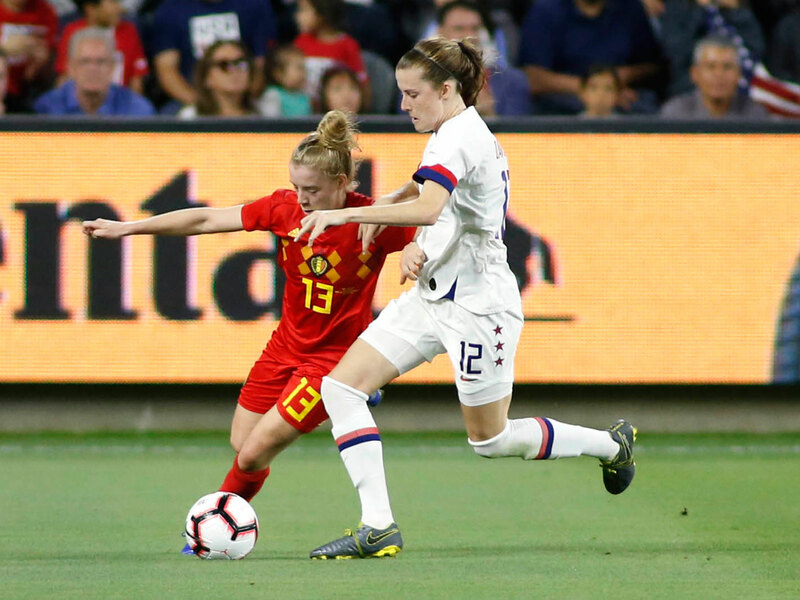 The Belgium match gave Ellis the opportunity to try out untested players and new alignments, including the return of veteran defender Ali Krieger two years after her last cap. Such lineup changes and experimental rotation don’t exactly lend themselves to defensive consistency–especially as the Americans prepare for the first major tournament in the post-Hope Solo era of goalkeeping. Before the Americans leave for France, they will play a three-game “send-off series” in May against South Africa, New Zealand and Mexico–teams unlikely to bring the same attacking intensity and potential like Australia, France, Japan or England. Their first World Cup match is scheduled for June 11. The shrug that Press offered as she walked away from reporters typified a win that, although dominant, felt more like a stepping stone than a statement. “It’s tough to stay on top,” she said.